We are continuing our look into the letter to the church in Smyrna found in Revelation 2:8-11. As I stated last time, I want to take the letter verse by verse, look at some history that will help us understand how the church at Smyrna may have received the letter originally, and then hopefully point out some relevant application for us. Let’s look at verse nine. Smyrna was a city that had seen its share of war, destruction, and death, but by the time John wrote his letter to the church located there, Smyrna’s loyalty to Rome had paid off handsomely and it had become a very prosperous city indeed. It boasted a famous stadium, library, and the largest public theater in Asia. Smyrna was rich, but right in the midst of all the wealth Smyrna possessed was a group of believer s who suffered intense persecution and poverty. 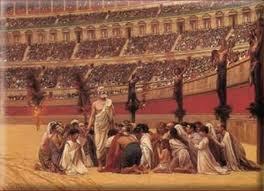 The persecution came from two main sources: Jews and Rome itself. A large population of Jews occupied Smyrna, and they despised the Christians. The Christians were associated with Judaism yet their claims regarding Jesus threatened to create waves in the community and destabilize civic relations between the Jews and the Roman leaders of Smyrna. It would seem that the Jews of Smyrna enjoyed at least some affluence and influence within the community, and the church in Smyrna was viewed as a threat to both. The Jews went to great lengths to disassociate themselves from the Christians in Smyrna, and hurt them in any way they could manage. Then there was Rome itself. At first it was the “spirit of Rome” the Dea Roma that had been worshipped. This Rome that had brought stability, prosperity, and peace (pax Romana ) was easily made an object of worship. But there is a certain degree of ambiguity when dealing with merely the “spirit of Rome.” So, the Emperor became the personification of this spirit, and voila; Caesar worship was born. Once a year the people had to burn a pinch of incense on the altar, and declare, “Caesar is Lord.” This is the one thing the Christians of Smyrna could not do. And for their disloyalty, they were branded as criminals and regularly faced imprisonment and death. Church of America, Jesus knows all about us. He knows our situation, and he knows our hearts. I’ve got good news and bad news for us who make up the church in America. The good news is Jesus knows. The bad news is Jesus knows. He knows those who are his, whose hearts belong to him. He knows the ones who claim to be His and are not. He sees when people make fun of you in the work place and universities on account of his name. He sees the tears shed in prayer. He knows every pressure brought to bear against you. He knows you and your situation. He also knows how we here in America have made church into a business. He knows our preoccupation with the things of this world. He sees it when we hate each other, and lie to one another. He knows how we love our doctrines and denominations more than we love him. He sees how we manipulate each other. He knows when we speak out of our own minds and imaginations yet proclaim, “Thus saith the Lord.” He knows that we love the American Dream more than we do him. He sees our self-absorbed demands for justice. Church, let us come to the One who knows us inside and out. May God’s Spirit help us see tribulation and poverty the way He sees it. May his words, “I Know.” be that which both brings us comfort, and leads us to repentance. Previous Post Smyrna: I Became Dead but Live! Next Post Smyrna: Stop Being Afraid!